Thought I might write about things I've been loving this past month since I have nothing much interesting to share, otherwise. Remember how in my NARS blog post I mentioned that I was afraid of using the shade Mistinguette from my Guy Bourdain blush palette? Well, I've finally tried it out and it is actually LOVELY! Despite being shockingly Barbie-pink in the pan, on the skin it gives off a really nice subtle flush. Quite amazing, actually. It's all I've been wearing in June! NARS' Pure Radiant Tinted Moisturizer has pretty much replaced all of my foundations last month. I think it is time for me to really sort out my make up collection because I can really tell which items I can't part with and items that I haven't touched for the past six months! NARS' Radiant Creamy Concealer is a staple.. I've already bought a back up for it yet I am still scraping off what ever's left in the tube. Benefit's Bad Gal Plum mascara.. Now that the formula has gotten a little dry, I find that I like it better than I used to. Mind, the plum colour which is supposed to make my eye colour "pop" is pretty much useless but just as a mascara, it's alright! Now on to skincare, I was given a sample of Origins High-Potency Night-A-Mins moisturizer sometime in the middle of last month and I've been saving it up until payday when I could actually get my hands on the regular pot! I really love how it feels on my skin, and the smell is just divine! I've been really loving it. For day moisturizer, I've been using the Origins GinZing Energy-boosting moisturizer. Pretty much served its purpose, I have no complaints. I got a bunch of samples of this so I'm good in terms of daily moisturizing until next month, at least. Can't really say it's a favourite if it's just what I am currently using, can I? But I do like it! 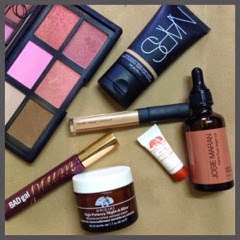 Recently I've discovered that I actually have dry skin, so I've been using the Josie Maran 100% Pure Argan Oil under my evening moisturizer. It's a bit too heavy for daytime (with wearing make-up and all) but for nighttime, it's just great. I really love slapping on the heavy-duty stuff in the evening. The awesome thing about this oil, you can use it on anything that you can think of! For instance, my skin is so dry that lotions don't really do anything for my skin (body butters are the way to go) but since I've been trying to use up Soap & Glory's The Righteous Butter Body Lotion before getting my usual moisturizer, I've been adding a few drops of the Argan oil to the lotion and it helped a LOT! Now can I go for something random and tell you about the chocolate that I've been LOVING? 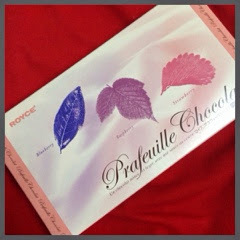 It is the Prafeuille Chocolate from Royce, that you can't even get in KL!! *curses* I was introduced by this on board, we used to have it in the business class sometime last year so when we stopped offering them, I had to start looking around for them myself. Now, I am no chocolate-fiend. If you tell me that I cannot have anymore chocolate for the rest of my life, I won't shed a tear. But this.. THIS chocolate.. I ADORE. It's a thin, leaf-like chocolate with a berry sauce centre.. Absolutely divine! Think After Eight, but thinner and with sweeter centre. Anyway, after months and months of searching, (Royce Malaysia no longer carries this chocolate) I finally found them in Hong Kong! -- I was in Osaka a few months ago, even they didn't have the Berry flavour! All they had was the Green Tea, and I DON'T ENJOY GREEN TEA! -- I know, the perks of travelling for a job, right? Anyway, SO glad to have this back in my life..
Is it a surprise that I don't LOVE chocolate? I do have a few favourites that I might actually even blog about them one day! hahahha, would that be a bit weird? Oh well, I am a little bit weird so that blog entry might actually happen. That's it for last month's favourite. I'm in a such weird mood right now, I am thankful for having this superficial-stuff to write about instead of the going-ons in my head!